Our seminar on flexicurity was introduced by René Lehweß-Litzmann. He gave us a critical reading of the European policy agenda on flexicurity. He has worked further on his introduction an published recently his dissertation. From a point of view of Capability Approach he examines the concept. The conclusion is that concepts as flexicurity misses a profound democratically ground. Flexicurity is a European policy agenda seeking to increase both flexibility and security in the national labour-markets. Though different from an approach centred solely on flexibility, flexicurity has been heavily contested right from the start. it is currently being reviewed in the light of new insights and altered conditions which have been brought about by the crisis after 2008. far from dropping the agenda, the European Commission proclaimed a “second phase of flexicurity”. Yet, it is argued here that flexicurity needs a re-make independently of the crisis. Although it is set out to profoundly alter the way Europeans work and live, and even though it is being justified by workers’ needs, flexicurity lacks of a clear and democratically justified idea for its societal impact. This book contributes to the discussion by confronting flexicurity with the capability-approach, a paradigm of human well-being evaluation proposed by Amartya Sen. How is flexicurity related to a concept of employment as part of a way of life which people should have reason to value? How capability-friendly are established flexicurity-indicators? 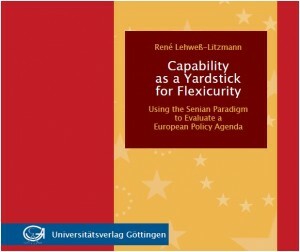 The book shows at the example of flexicurity how the CA can be applied in the field of labour-market and social policy.